Light, Thin, Luxury. Best Mobile and Laptop Power Bank can Support Mobile phones, smart phone, tablets, Ipad, Samsung Tablet, 65W laptop and ultra book. 14,000 mAH Battery Pack, eUSB cable (18~20V), 8pcsT tips, 10pcs R tips, User manual. weight 445g. Pay only P 999 a Month for 6 months. Or pay only P 534 a Month for 12 months. Accessories eUSB cable (18~20V), 8pcsT tips, 10pcs R tips, User manual. 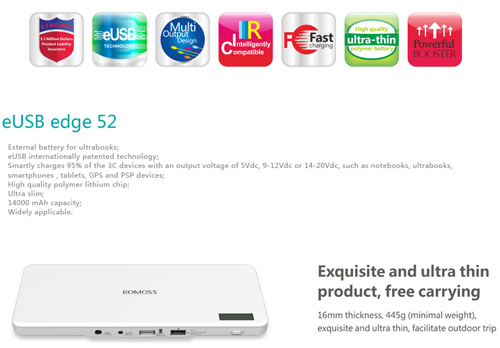 Supporting Device Mobile phones, smart phone, tablets, Ipad, Samsung Tablet, 65W laptop and ultra book.